Goodreads: Tough, resourceful and ruthless, ex-SAS trooper Nick Stone is now working for British Intelligence on deniable operations. And is desperately in need of cash. I am hooked on Andy McNab’s books now I read one and I just keep picking up the next one, normally I get bored reading a series and have to read other books in-between but not with the Nick Stone series I started book 4 this morning and am already half way through am glad i still have another 11 left to read. When Kelly develops PTSD and has to have private medical care Nick has to put all his money in to her treatment, strapped for cash and with no jobs going at the firm since the Whitehouse screw up he thinks his problems are over with a freelance job. He is sent to Finland to capture a Russian mafia warlord, but when circumstances change Nick finds himself making a bargain with the same man he was sent to capture. Sent to the poor underworld of Estonia Nick must find who is trying to enter military secrets. But with things not going to plan, lies been told and government agents on his trail will Stone make it out of Estonia? And to what welcome if the firm finds out? I liked this book, once again Andy Captivates the reader, From page to page you can’t put the book down! You have a constant adrenaline rush as you follow Nick though the story wondering how he is going to get out of the situation. In this book Nick is up against Government agents so you always wonder what if they can identify him, how is he going to get out of this? I think the storyline to this book was slightly slower than other not so much slower but less quick moving around, on the other hand you do follow Nick through miles and miles of snow and wonder how he will survive the elements. A lot of jobs go wrong in this book so he is constantly having to adjust his plans which just adds to the suspense, I think the only thing I didn’t like was that he gets captured and beaten up a lot, it seems everywhere her goes some gets him and beats him up. On the other hand it just adds to the suspense because you can see he is injured, he has no resources, the weather is slowing him down and taking its toll and you just don’t know what is going to happen. Like the other books this one is amazingly written, packed with action, fights and conspiracies! 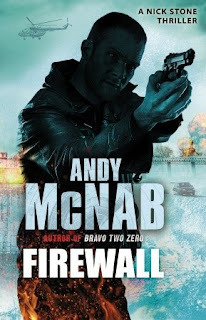 McNab is an amazing author and his descriptions and attention to detail is fantastic, you can see the story play out in full colour in your head just like you watching a movie! I felt really sorry for Nick in this book, he's constantly cold, hungry and constantly getting beat up, it seems he has nowhere to turn without someone trying to get him. Combined with his concern for Kelly and his lack of money you really see a down and out Nick in this book. I think it definitely shows that that line of work is not glamorous at all!